Wader Quest: The wierd world of wattled waders. The wierd world of wattled waders. A number of waders have evolved spectacular wattles on their heads. Principle among these birds are the lapwings but a couple of jacanas show flambouyant face furniture too. Certainly the most extensive wattles belong to the Masked Lapwing of Australia and New Zealand. The large wattles extend over and behind the eye and merge with the yellow orbital ring and the long lappets hang down over the side of the face. 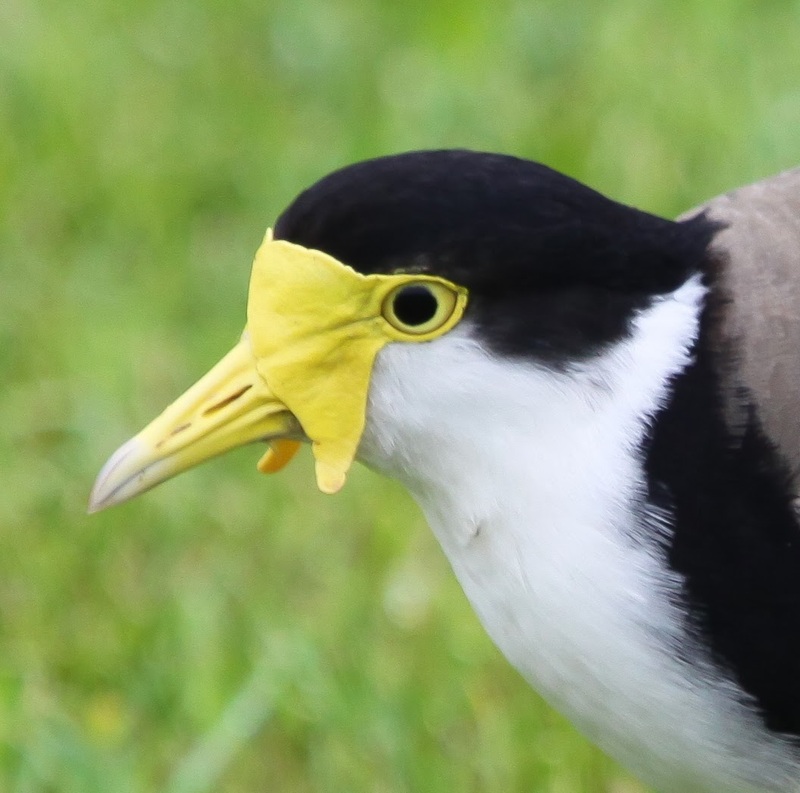 Masked Lapwing Vanellus miles miles; Cairns, Queensland, Australia. Those of the southerly race novaehollandiae have less extensive examples than those of the northerly and nominte race miles. The top edge of the wattled becomes the upper half of the orbital ring instead of swallowing it up and the lappets are much smaller. Masked Lapwing Vanellus miles novaehillandiae; Foxton, Wanganui-Manawatu, New Zealand. Moving slightly north to Java, a now extinct lapwing called the Javan Lapwing also displayed prominent wattles. They are somewhat faded on this museum specimen, but were bright yellow in life. This specimen appears to show that there was no orbital ring but it has probably faded with time. Javan Lapwing Vanellus macropterus; British Natural History Museum - Tring bird collection. Further north still in India, another bird with yellow wattles can be found, the imaginatively named, Yellow-wattled Lapwing. 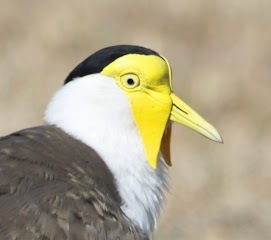 It is similar in many ways to the Masked lapwing but the wattles are much diminished in comparison and it has a brown face and neck not white as in the Masked. The small wattle and lappet are connected to the yellow orbital ring at the front. Yellow-wattled lapwing Vanellus malabaricus; Jatoli Ghana, Rajastan, India. 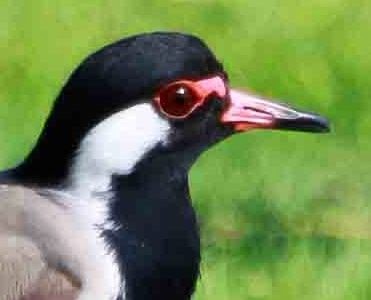 In the same region as the Yellow-wattled Lapwing the Red-wattled Lapwing can be found. The wattle on this bird is very small and looks like a small red finger poking forward from the red orbital ring. Red-wattled lapwing Vanellus indicus atronuchalis; Laempakbia, Phetchaburi, Thailand. The birds in the UAE of the same species we saw differ in plumage, but the wattle is much the same, individuals differ obviously, this one is not very large..
Red-wattled lapwing Vanellus indicus aigneri; Piivot Fields, Dubai, UAE. This young bird has a way to go before it is going to impress anyone with its wattle. Red-wattled Lapwing fledgling Vanellus indicus aigneri; Pivot Fields, Dubai, UAE. 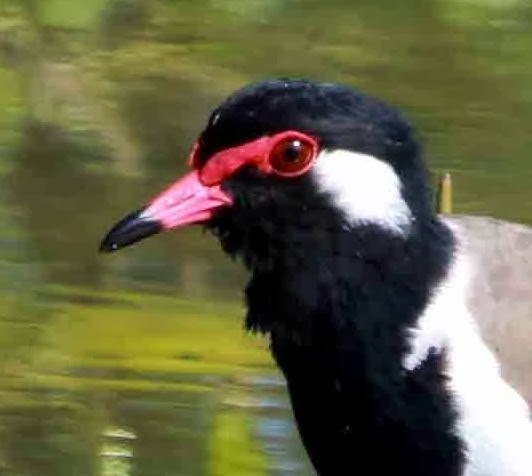 On the subject of diminished red wattles, the Banded Lapwing of Australia as a very small bump as a wattle that connects to a yellow orbital ring a very pleasing effect though and the similarity to the western forms of Red-wattled Lapwing is striking. Banded Lapwing Vanellus tricolor; Point Cook, Victoria, Australia. Spot-breasted Lapwing Vanellus melanocephalus; British Natural History Museum - Tring bird collection. 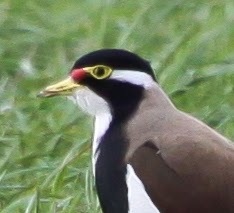 and Brown-chested Lapwing with a slightly more impressive wattle, which breeds in West Africa and winters in East Africa but has very restricted ranges in both regions. Brown-chested Lapwing Vanellus superciliosus; British Natural History Museum - Tring bird collection. Back in the land of the living and still in Africa we come across the most impressive lappets of all these birds in the White-crowned Lapwing, this is a truly impressive looking bird which we couldn't quite believe when we saw it for the first time. White-crowned lapwing Vanellus albiceps; River Chobe, Kasane, Botswana. 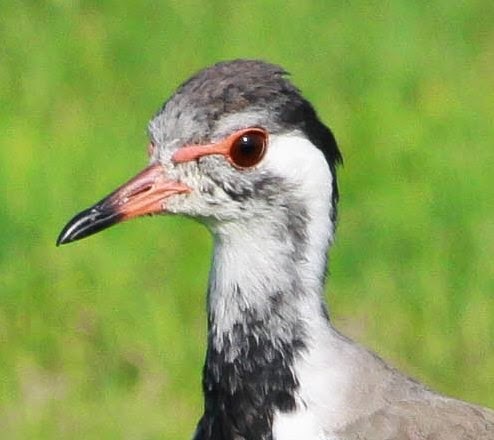 The bird known as African Wattled Lapwing has perversely smaller wattles than the White-crowned, but what it lacks in size it makes up for in variety having yellow lappets and small round red wattles. African Wattled Lapwing Vanellus senegallus; River Chobe, Kasane, Botswana. That brings us to the end of the Vanellus lapwings, leaving us with just two jacanas to look at. I suppose the first ought to be, because of its name, the Wattled Jacana of South America. Very impressive frontal shield and neat little wattles. Wattled Jacana Jacana jacana; Tavares, Rio Grande do Sul, Brazil. 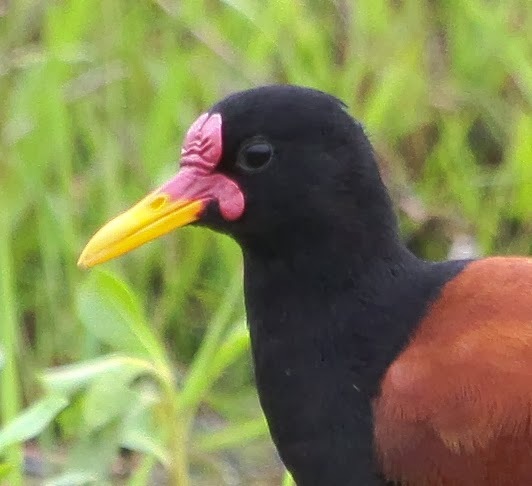 The last in this series of wattled birds is the Comb-crested Jacana from Australia, and what a wattle it has. In truth it is more a chicken like comb as the name suggests, pretty impressive. Comb-crested Jacana Irediparra gallinacea; Cattana Wetlands, Cairns, Queensland, Australia.